Chicago Street Theatre's Childrens Theatre Works Fall semester begins the week of September 12 and ends with a Showcase & Certificate Ceremony the week of December 12. Take a look at the offerings below and visit our education page for details on registering! Designed to continue developing young theatre artists’ understanding of the director’s craft, this elective will explore and further apply skills developed in Directing I,including vision & concept, script analysis, blocking, collaboration, and rehearsal techniques. Students will choose a 5 minute piece, cast it, set up a Director’s Notebook, and rehearse the piece for performances during our Showcase Week. Must have taken Directing I (Special or Elective) to participate in this class. This class is an energy-packed exploration of imagination. The emphasis is on creative expression through structured play. Young students learn to “act out” a story while important skills such as listening, concentration, and collaboration are introduced. New and returning students will benefit from this class. This class is an exciting initiation where students are guided through the foundational elements of drama (who, what, and where). While acting out favorite stories and playing theatre games, students explore imagination and creative expression with a purpose. The emphasis is on extending concentration and focus while illuminating discipline, self-esteem, empathy, understanding, and basic problem solving. New and returning students will benefit from this class. In this stimulating class, students learn to sharpen their work in improvisation and theatre games while transitioning into scripted material. The concept of “playing” the wants and needs of characters is introduced, as they are taught to understand the importance of “listening.” The continued emphasis on concentration, discipline and self-esteem is enhanced through collective and constructive assessment. New and returning students will benefit from this class. In this exploratory class, students continue to sharpen their work in improvisation and theatre games while creating and developing original scripted material. The concept of “playing” the wants and needs of characters is applied through the creation of scenes. The continued emphasis on concentration, discipline and self-esteem is enhanced through collective and constructive assessment. New and returning students will benefit from this class. This challenging course focuses on bringing a character to life through an advanced exploration of text. Students learn to identify and play objectives( wants/needs), how to break a scene into beats, and continue to explore “listening and responding.” Students will also develop skills to analyze and critique dramatic work and suggest alternative artistic choices. New and returning students will benefit from this class. Advanced BUDS & BLOOMS students are invited to become a Member of the Teen Ensemble, performing in the 2nd Annual CTW Teen Festival in May. During the Fall semester, we will work on character development, script analysis and ensemble, while exploring the performance pieces. They will be chosen for the first day of the Fall semester. During the Spring semester, we will apply the skills learned in the Fall, and rehearse the plays for performance in the Festival. Signing up for these advanced classes requires a commitment to both the Fall and Spring Semesters and availability for the following dates: Tech Week: May 2, 3 & 4 (7:30-9:30 pm). Performances: Friday, May 5, Saturday, May 6 & Wednesday, May 10 at 7:00 pm, along with Saturday, May 6 at 2:30 pm. Chicago Street Theatre is currently seeking a part-time Instructor for our Education Program, beginning September 10, 2014. For a complete description of our program including mission, please review our education page. Ideally, qualified applicants will have a Bachelor's degree in theatre, with a minimum of 1-2 years classroom experience. Please email letter of application along with CV and list of three professional references via email BY AUGUST l8, 2014 to: Lisa Formosa-Parmigiano, Director of Education. No phone calls please. Hourly compensation commensurate with experience. Posted by Jonni Pera, Board Chair and SPARK volunteer. Saturday, March 16th was an exciting day at CST. We began our SPARK program, SPecial ARtists Kollaboration. Fulfilling our mission to reach out to the whole community, we have begun a theatre program to include artists with special needs. And we were wowed by the small group that attended!! Lisa Formosa-Parmiagano, our Director of Education, led this theatre workshop based on her basic theatre education curriculum. The group of 5 young women met and discussed their background and desire to be creative. We toured the building including the rehearsal studio, sound and light booth, the make-up and green room, the paint room, and lighting room, and also the costume room. 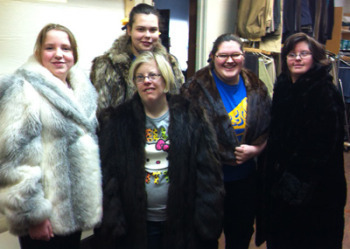 They all agreed they really enjoyed the costume room where they got to try on wigs and fur coats. They also enjoyed trying out the follow spot and seeing where the actors put on their costumes and make-up before a show. We returned to the rehearsal studio to ‘play’ some theatre games. The final game was getting to select a character hat and becoming that character as they interacted with Lisa. As a helper for the day, I must say I left the theatre excited and happy! 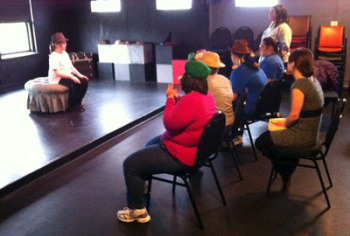 The group thoroughly enjoyed the opportunity to explore the theatre and have a chance to act the part of their hats. “This was a really special day! I loved getting to be a part of the theatre!” Kitty stated as she left CST. “We want to come for another theatre class! !” was a comment heard from more than one of the students. The teens appearing in our upcoming production of The Less Than Human Club are tackling some really compeling issues in preparation for opening night this Friday. We are so lucky to have such an incredible group of teens working with us!